What does it mean if there are 2 different figures for a dimension on a blueprint? I am trying to read a technical 2D CAD drawing of a machine screw. This is the fastener in question. This is a link to a PDF of this fastener's blueprint. I added the blue arrows to highlight instances of confusion. What does it mean if there are two figures provided for the same dimension? I thought that maybe these two figures referred to a "tolerance" of possible values (that is, a "minimum" and a "maximum"), but I'm not confident in this theory because, in all four instances, the greater number is on top (which seems counterintuitive to how a range is typically expressed). I tried looking up "ASME B18.6.3" to see if it contained any hints, but it costs $107 to view this document. Also, if no units are provided on a blueprint like this, how do I know if the figures are measured in inches or millimeters? Fastenal is a U.S.-based company, so I expected that they use the imperial system, but the figures contain odd numbers, so, on the other hand, they might be using the metric system. The two numbers represent the minimum and maximum range for the dimensions shown. The stud/thread size is shown as 1/4-20 which is a standard inch size fastener. 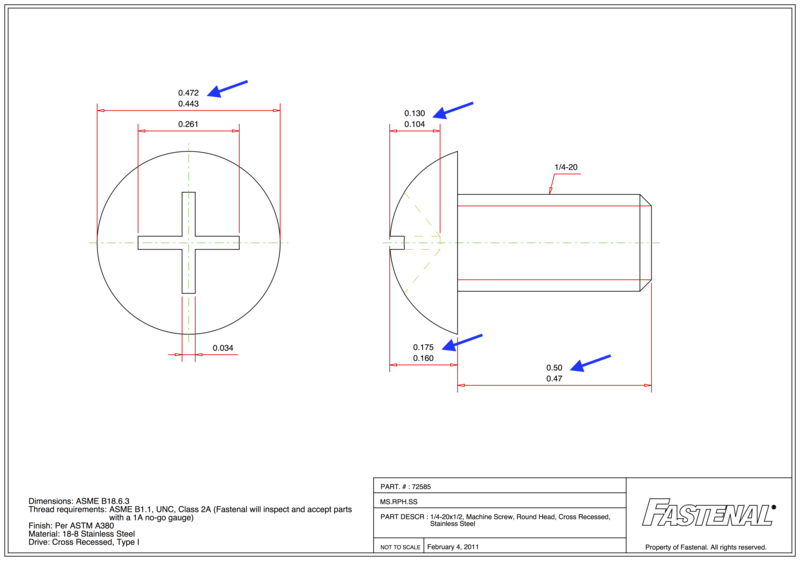 The dimensions of the head size for a 1/4-20 fastener fall in line with what you would expect for such a fastener. For example a head diameter in the range of 0.443 to 0.472 inches is logical for a 1/4 inch diameter fastener. What is this zip tie like nail?